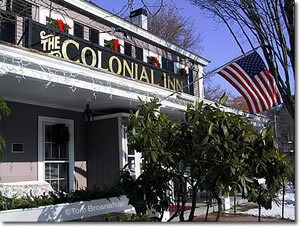 Concord has several inns and B&Bs right at its center, others nearby, and hotels and motels on the outskirts. On MA Route 2 west of Concord in Acton, it's a low-budget choice suitable for those with a car. Hotels in Bedford MA, 5 miles (8 km) northeast of Concord, are easily accessible along Bedford Road (MA Route 62; map). Hotels in the cities of Burlington and Waltham are farther away, sometimes through heavy and/or confusing traffic (I-95/MA Route 128), though your GPS may solve that problem. is a social center in Concord MA. 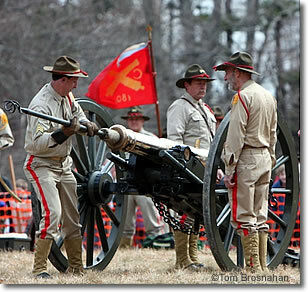 Below, loading the brass cannon on Patriots Day.